Hallo, fellow readers! Welcome to the first weekly post of 2018. I hope you're ready to share some serious booklove with me this year. Let's get going! Erika Johansen might be new to publishing, but she's a wise old storyteller on the inside. I spent the last three days in a bookish fever, reading Johansen's The Queen of the Tearling trilogy. I'm not quite finished with it yet, but it's only a matter of an hour or two. Is THIS why I couldn't sleep last night? Because every time I closed my eyes, I could just feel that book burning to be read on my nightstand? Perhaps, my friends. Purrrrrr-haps. Behold! I have reviewed each book! 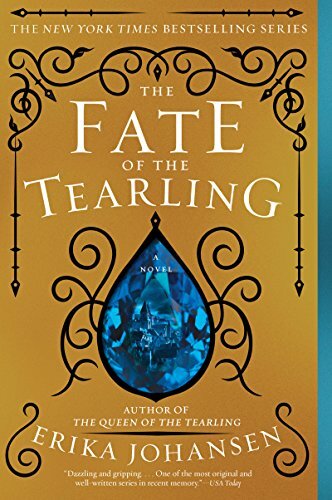 The heroine of The Queen of the Tearling, 19 year old Kelsea, is a protagonist built for readers like me: a little dreamy, not used to hard physical exertion, a devoted lover of books and literacy , a bit too pragmatic to be bewildered for long, bright enough to keep herself upright. Unlike me, though, she inherits a kingdom in a fantasy world that’s somehow posited in the future, after the Americans and British have been forced to flee via boat due to...Well, I’m still working on that part. Anyway, Kelsea’s efforts to gain - and keep - her throne despite long odds is a refreshing, uncluttered, and sophisticated tale. The characters spark and sing; the plot unspools itself as it should, moving faster and faster as the end approaches. And all along, something dark is is gathering...An excellent tale. Thank goodness it’s a trilogy! So much revealed here in Book Two, including much of what I was working to figure out as I finished Book One. The Invasion of the Tearling picks up exactly where The Queen of the Tearling left off - no years going by in a twinkle, nothing solved or shoved aside. Queen Kelsea remains on the throne, but it’s a precarious perch, to be sure: the invasion of the Tearling by the Mortmesne Army is close at hand. As war beckons and breaks, however, the Glynn Queen’s own power grows. Her transformation from child to Queen dominates the book’s narrative arc, of course. But other important stories swell alongside Kelsea’s own, and more than a few characters - some already well established, others new - become essential, lively, complicated. This book offers a much darker vision than the first, but don’t let that scare you away, because there’s still room for wonder, and second chances abound. It wasn't all fantasy world books this week. I also read Edwidge Danicat's lyrical slip of a novel, Claire of the Sea Light, and Andy Weir's Artemis, which was lots of fun but had some disappointing limitations. Alas. Seriously, how wonderful is this?? Nina Riggs's widower and Paul Kalanithi's widow are falling in lurv! Finally, take a minute to check out the other posts I made last week and admire my new layout! I'm so excited to share my book life with you! Well, my week ahead will be full of fun vacation reading, because WE ARE GOING TO MAUI!! Aloha! This is our first visit outside the continental US as a family. I'm so excited! In other news, two books that I've preordered drop on January 9th: Chloe Benjamin's The Immortalists and Seanan McGuire's Beneath the Sugar Sky. I know what I'll be doing on the plane!